Hoppin Bobbin quilts our quilts with a Gammil quilting machine that is digital capable. 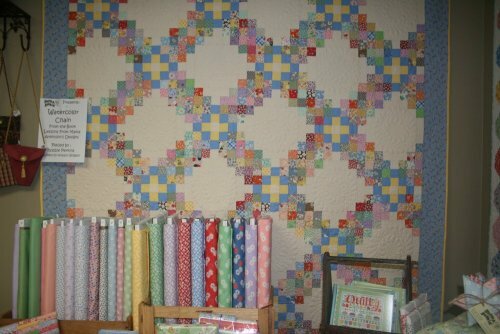 This allows us to choose from thousands of patterns to enhance your quilt. Designs are chosen to suit your fabrics, pattern and who your quilt has been made for. From our wide selection of patterns, we will help you choose the appropriate design for your special quilt. From Edge to Edge to Custom quilting, we have the designs to turn your quilt into a treasured, family heirloom. Proper quilt preparation will save us time and you money. By following the preparation steps below you can avoid time delays and “add-on charges”. If you pre-wash your fabrics, it is best to pre-wash all of them. 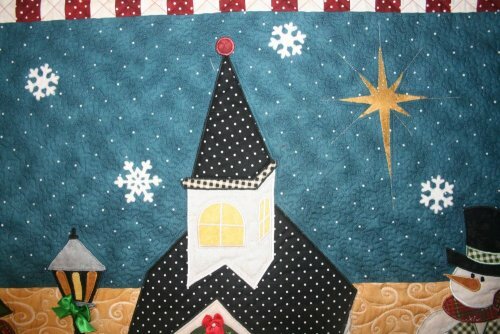 Remember when piecing, fullness that is pieced in, cannot be quilted out. 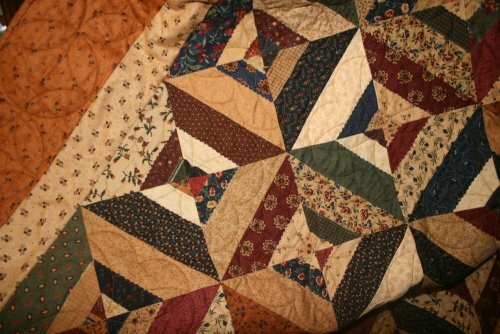 Avoid handling your quilt by the borders once they have been attached. This can stretch them, causing them to become loose and wavy. Straight borders, cut from the length of the grain, (parallel to the selvage) lay much flatter than those cut cross-grained. “Ripping” borders is not recommended. Please attach borders by measuring three times and using the average. Your quilt will quilt best, if the quilt top and backing, are square and flat. know so we can allow for enough space when we place the quilt on the machine and trim the backing and batting after quilting. Clip all loose threads from back and front of quilt top. Press your quilt top thoroughly. Square up backing fabric. This is necessary to ensure there are no tucks or rolls in your backing. Do NOT baste, pin or tack your quilt together. Just press and fold each piece. 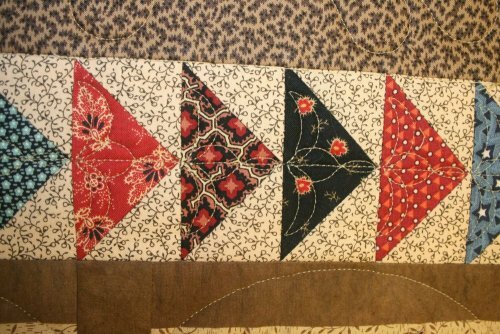 Remember that raised embellishments must be attached AFTER quilting. Custom Quilting is by appointment only and must be scheduled in advance. 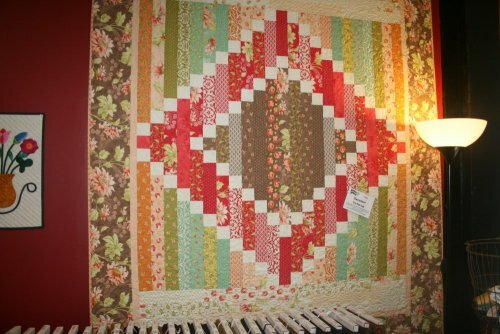 Hoppin Bobbin will gladly design and create the perfect quilting design for your special quilt. If you would like to participate in this process, it will require scheduling an appointment to discuss the options for completing your quilt.Our goal is to enhance your creation into a finished piece of art. Edge to Edge: All over design. Priced from $.0175 to $.05 per square inch, depending upon the detail and density of the design. Custom Quilting is by appointment only and must be scheduled in advance. This is a planned design that includes separate designs for blocks, ditching, sashing and special fill effects. Prices will vary depending on the complexity of the work and patterns. Starting at $.05/ square inch. 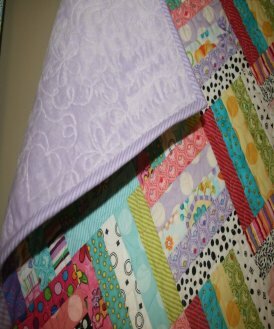 There is a thread charge starting at $5.00 for each quilt. This charge is based on thread usage and bobbin changes. Each quilt will have a new needle provided at no additional charge. Hoppin Bobbin will charge a minimum fee of $45.00 for all edge to edge projects and $100.00 for custom projects. Edge to Edge designs generally have a 6- 8 week turn around. If you need something quickly, we have a rush service available. 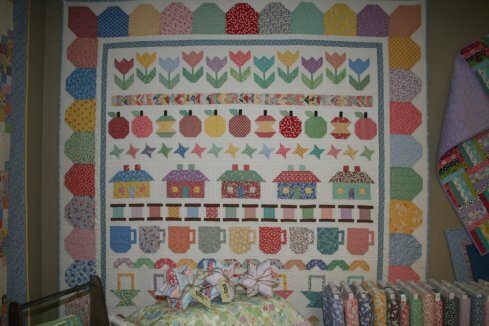 Custom quilting turn around, is 10-12 weeks. Make and Attach - You supply the fabric and we will make and attach so that you can hand stitch down, $0.19 per linear inch. Attach only - You provide the pre-made binding and we will attach it $.11 per linear inch for you to hand stitch. We are always happy to provide an estimate, for quilting, free of charge.